The Famous Garlic Noodles recipe at Crustacean in Beverly Hills has been a heavily guarded secret for nearly 20 years. In fact, the dish is made every day behind closed doors, in a separate “secret” kitchen off the main kitchen. Many people, including famous celebrities, have requested access to the secret kitchen, but they all have been denied. Much like the secret formula for Coca-Cola or KFC’s original recipe of 11 herbs and spices, the recipe lives with a select few. In my opinion, the noodles are good, but the reason they’re “famous” is because of the intrigue surrounding the recipe, one which has become coveted by many. In fact, search the internet and you will find dozens of copycat versions of the dish, proving once again that imitation is the sincerest form of flattery. Today I am adding my version to the group of imitators, which I created years ago for a friend. It may not be exactly the same, but it’s pretty darn tasty. Enjoy! 1. Cook noodles in boiling water for 4 minutes (or 1 minute if using using fresh noodles). 2. Meanwhile, melt the butter in a saucepan over medium heat. Add the garlic and cook for 2 minutes. Add the next 4 ingredients and remove from heat. Set aside. 4. Heat a large wok to medium heat. Add 3/4 of the garlic sauce. Add the noodles, scallions, cooked shrimp, and a few turns of the black pepper mill. Add a few drops of the reserved water to loosen noodles. Taste to see if you need the remainding garlic sauce. 5. Add the Parmesan cheese. Mix well. 6. Remove from heat. Divide noodles among 4 bowls and top with chopped cilantro. Serve immediately. 1. Mix all ingredients in a glass bowl and marinate in the refrigerator for 20 minutes. 2. Remove from the refrigerator. 3. Heat a large sauté pan over medium-high heat. Coat with oil. Add the entire shrimp mixture at once. 4. Sauté shrimp for roughly 5 minutes or until just cooked through. Remove from heat. Set aside until ready to use. This entry was posted in Noodles, Seafood, Uncategorized and tagged Garlic Noodles, garlic noodles with shrimp, shrimp noodles on November 29, 2015 by food4so. As we close in on Thanksgiving, here is a simple muffin recipe that is perfect for the holiday. Whether you are hosting Thanksgiving or showing up as a guest, these can be whipped up in no time and will definitely be a crowd favorite with the kids and adults alike. In fact, I find myself making some sort of muffin recipe at least once a week because my kids love them so much. The muffins themselves are just mildly sweet, but the chocolate makes up for it! As with any recipe, it is important to use the best ingredients, as your recipe is only as good as the ingredients you start with. As long as you have everything on hand, the active prep time should be less than 20 minutes. The muffins also bake in less than 20 minutes. If you prefer, you can substitute the total amount of spices listed in the recipe below with 1 1/2 teaspoons of pumpkin spice, which you should have no trouble finding in the spice section of your supermarket during the holiday season. Happy baking! 1. Preheat Oven to 400°. Line muffin pan with 12 cupcake liners. 2. In a medium bowl add all the dry ingredients (the first 8 ingredients). Whisk and set aside. 3. In a stand mixer with a paddle attachment, add the sugar and oil. Set on medium speed until completely blended. 4. Add the eggs, one at a time until just blended. 5. Add the vanilla and pumpkin puree mix until smooth. 6. On the lowest speed setting, slowly add the dry ingredients until just blended. 7. Remove the bowl from the mixer. Using a rubber spatula, gently fold in the chocolate chunks in until evenly distribute. Don’t over mix. 8. Using a large ice cream scoop, scoop into the liners. 9. Using a teaspoon, sprinkle the crystal sugar on each section of the muffin batter. 10. Place the muffin pan in the oven and bake for 18-20 minutes or until toothpick comes out clean when inserted in the center of the muffins. 11. Let the muffins cool in the pan for 5 minutes; remove and then transfer to cooling rack. 12. Enjoy them warm with a cup of milk or coffee. This entry was posted in Breakfast, Brunch, Muffins and tagged Breakfast, Muffins, Pumpkin Muffins, Pumpkin Muffins with Chocolate Chunks, Pumpkin Muffins with Dark Chocolate on November 23, 2015 by food4so. Thanksgiving is one of my favorite holidays of the year. It’s the one meal I get really excited about cooking. I usually spend a day planning the menu, a couple of days prepping the ingredients, and several hours cooking in the kitchen. Aside from the turkey or ham that is central to the meal, there are side dishes that my family looks forward to every year: roasted Brussels sprouts, savory pain de mie stuffing, cauliflower gratin, among others. My family raves about how yummy everything tastes and it puts a smile on my face. Cooking is a true labor of love. But cooking a Thanksgiving meal wasn’t always easy or fun for me. I remember my humble beginnings, cooking my first Thanksgiving meal back when I was in junior high. My immediate family and my Korean neighbors (there were a total of 20 guests) were excited about their first traditional Thanksgiving dinner…only to learn the centerpiece of the meal was missing from dinner table. I completely miscalculated the cooking time of a 22 lb. turkey and it still had a couple more hours left to cook in the oven when everyone arrived. Since my guests were hungry, they ate the stuffing, candied yams, and mashed potatoes while the turkey was still roasting. A couple of guests even ran back to their places and brought over some rice, kimchee and several ban chan for the table. When the turkey finally came out of the oven, it ended up being dry and pretty bland, a major disappointment after such a long wait. I felt awful and vowed to never make the same mistake again. Next year, the turkey was ready early! 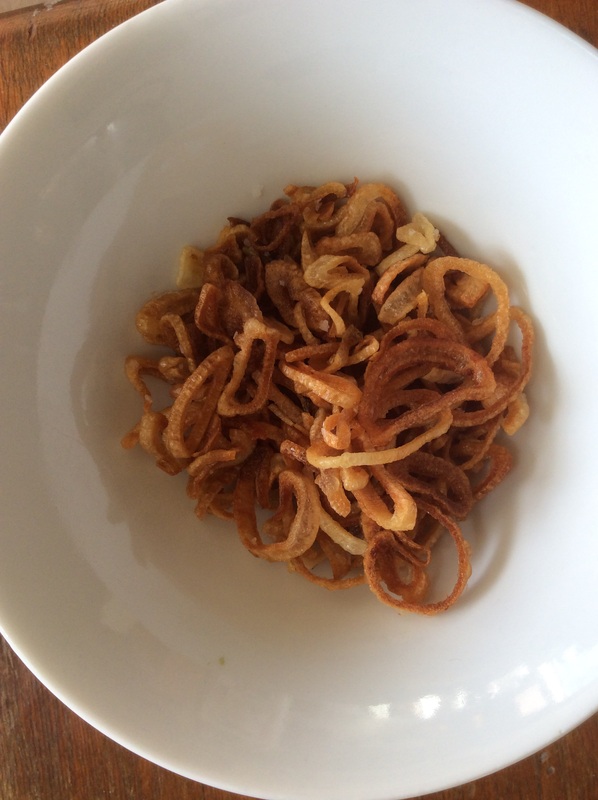 As we ramp up for Thanksgiving this year, I will be posting a couple of my favorite side dishes. Here is a great Brussels sprouts dish with an Asian twist. It is flavorful, has a hint of heat and different layers of texture. This will be a great addition to any Thanksgiving table. 1. In a small saucepan, combine the soy sauce, fish sauce, sugar, chili paste, and garlic. Cook over medium heat until the sugar is dissolved and the sauce thickens a bit (about 5 minutes). 2. Remove the sauce from heat, add the lemon juice and set aside to cool. 3. 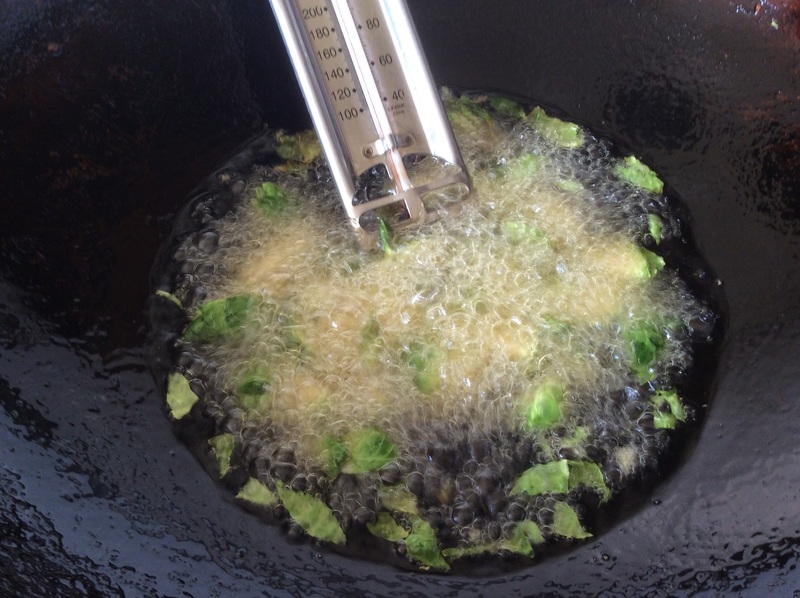 Place 2 cups of oil in a wok or a deep fryer. Bring the temperature to 275°. 4. 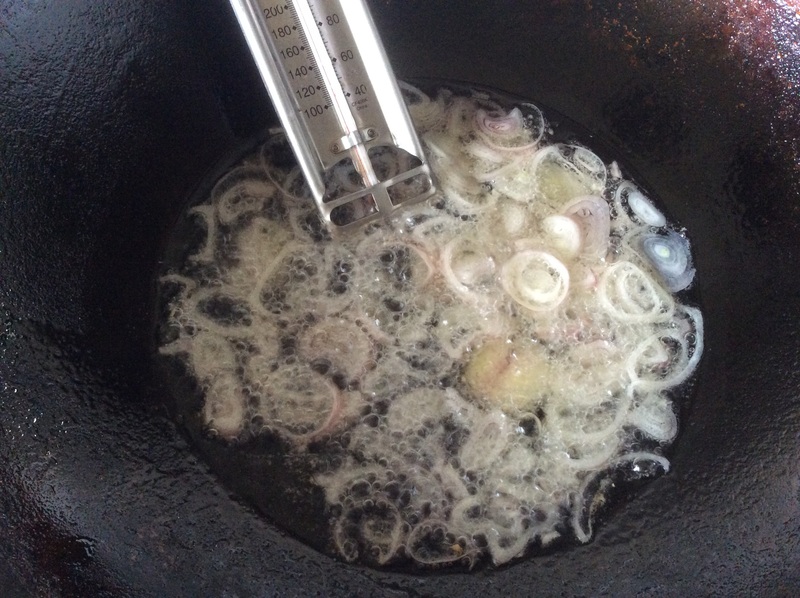 Add all the shallots at once and fry for about 8-10 minutes or until the shallots are golden brown. 5. Remove from the oil with a slotted spoon or spider strainer and place in a colander lined with paper towels. Sprinkle with sea salt and set aside. 6. Increase the heat of the oil to 350°. 8. Transfer all the fried Brussels sprouts to a large bowl. Add the toasted almonds. 9. Add 2 tablespoons of the sauce and toss to coat. Taste to see if it needs more sauce. If so, add one more tablespoon of the sauce and toss to coat. 10. Transfer to a serving bowl. Top with shallots and serve. 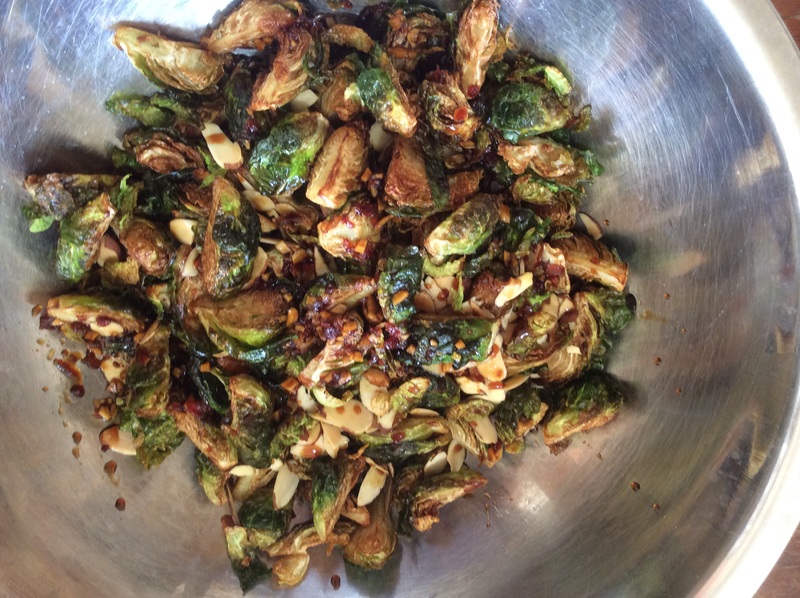 This entry was posted in Side Dish, Thanksgiving, Vegetables and tagged Asian Fried Brussels Sprouts, Asian-Inspired Brussels Sprouts, brussels sprouts, Deep-fried Brussels Sprouts, Fried Brussels Sprouts, Fried Brussels Sprouts with Asian Dressing, Fried shallots, Spicy Asian Brussels Sprouts on November 15, 2015 by food4so. Many Americans have their go-to potluck recipe and it’s usually some type of casserole dish that can feed a large group. Growing up in a Korean household, casseroles were foreign to me. I made my first casserole in 7th grade after purchasing a used Sunset cookbook at a garage sale for 25¢, which I read from cover to cover. The first casserole dish I made was Chicken Casserole with frozen vegetables, cream of mushroom soup, and bread crumbs. I made it and thought I cooked it incorrectly because it didn’t taste very good. I tried other casserole recipes, but everything was a disappointment until I came across a strata recipe. This one was different from the rest, layered with bread, cheese and an egg custard. It was essentially a savory bread pudding. It was so good that this became my favorite casserole recipe. Years later, I added my own spin to it by including different ingredients like bacon, mushrooms, tomatoes, green onion, Swiss chard, etc. Here is a great one to serve during the Holidays for a family brunch. It has my favorite breakfast ingredients: eggs, turkey sausage, spinach, mushrooms, and cheese. It’s a one-pot breakfast. You can even assemble the ingredients the night before and place it in the refrigerator, then pop it in the oven the next morning and viola, breakfast is served. Heat a large skillet to medium. Add 2 tbs. of olive oil and onion and sauté for 2 minutes. Add garlic and sauté for 30 more seconds. Add the turkey sausage, mushrooms, a pinch of salt, black pepper and red pepper flakes. Sauté until golden brown. Remove the sausage and mushroom mixture from pan and set aside. Add spinach to the same pan and sauté until wilted. Remove liquid. Add the spinach to the mushroom mixture. In a large bowl whisk eggs. Add milk, mustard, ½ teaspoon salt and pinch of pepper. Whisk until combined. Set aside. Mix the Comte and Parmigiano a small bowl. Set Aside. Begin the layering process. Add 1/3 of the bread on the bottom of the casserole dish. Add ½ of the sausage mixture and 1/3 of the cheese mixture, evenly spreading over the bread. Repeat and top with bread mixture. Save the last 1/3 of cheese mixture and basil leaves. Pour the liquid mixture over the layered ingredients. Press down to absorb. Add the remaining cheese mixture and basil leaves. Cover with aluminum foil. Place in refrigerator for 30 minutes. Add the strata with aluminum foil in the oven for 30 minutes. Increase the oven temperature to 425 degrees. Remove the foil. Bake for an additional 5-10 minutes or until golden brown. Remove from oven and place on the cooling rack. Let cool for 10-15 minutes. Cut and serve with a side salad. 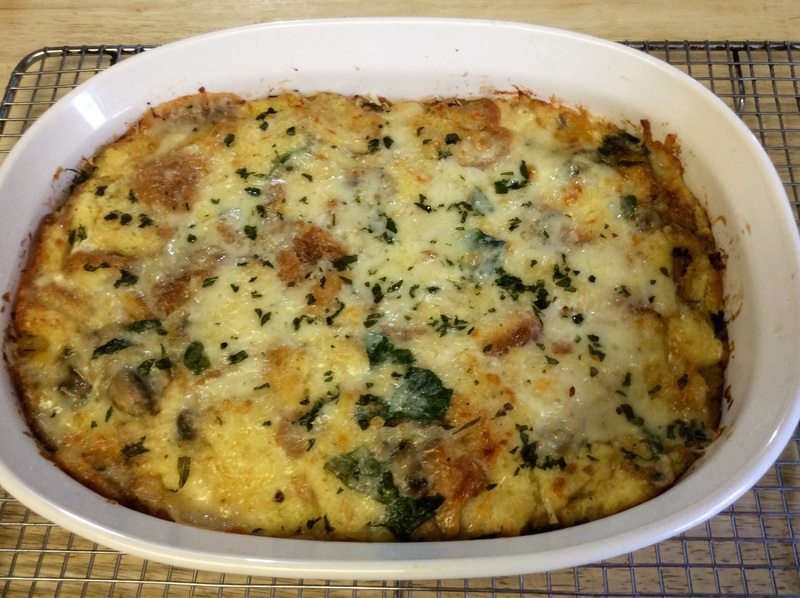 This entry was posted in Breakfast, Brunch and tagged Breakfast, Breakfast strata, Brunch, Casserole, Strata, Stratta on November 8, 2015 by food4so. It is difficult to find a well-executed risotto, even at the best Italian restaurants. Unlike many Italian dishes, risotto requires the chef’s undivided attention throughout the cooking process, which takes around 40 minutes. Restaurant chefs don’t have that kind of time to dedicate to a single dish, so instead they par-cook the rice during prep and then finish it off after the guest orders, cutting the final cooking time in half. While this process saves guests from a long wait for their food, it hurts the integrity of the dish. Perfect risotto needs to be stirred and watched constantly so that the rice cooks evenly. It is the dish that has sent more contestants home from Top Chef than any other. Clearly there is no place for risotto in a fast-paced cooking competition, because risotto waits for nobody. Risotto is the perfect dish to cook at home on a Sunday evening or whenever you have an hour to spare. People who haven’t made it before often think it’s difficult, but it’s actually quite easy, it just requires some time and attention. Here is the perfect risotto recipe for the fall season. 1. 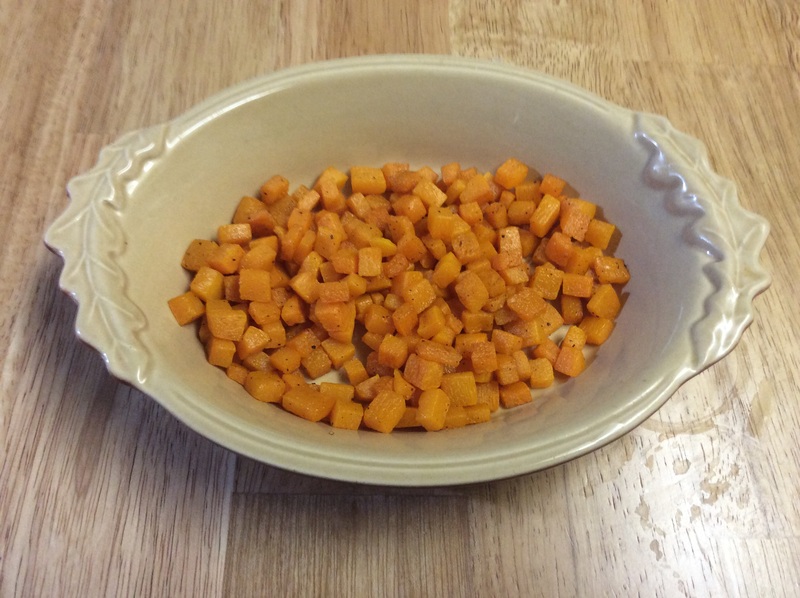 On a baking sheet, toss the butternut squash in olive oil and sprinkle with salt and pepper. 2. Roast in the oven for 10 minutes. 3. Remove from the oven and cool on a rack. Once cool, transfer the butternut squash to a plate and set aside. 5. In a large Dutch oven (like a Le Creuset), heat 3 tablespoons of olive oil on medium. 6. 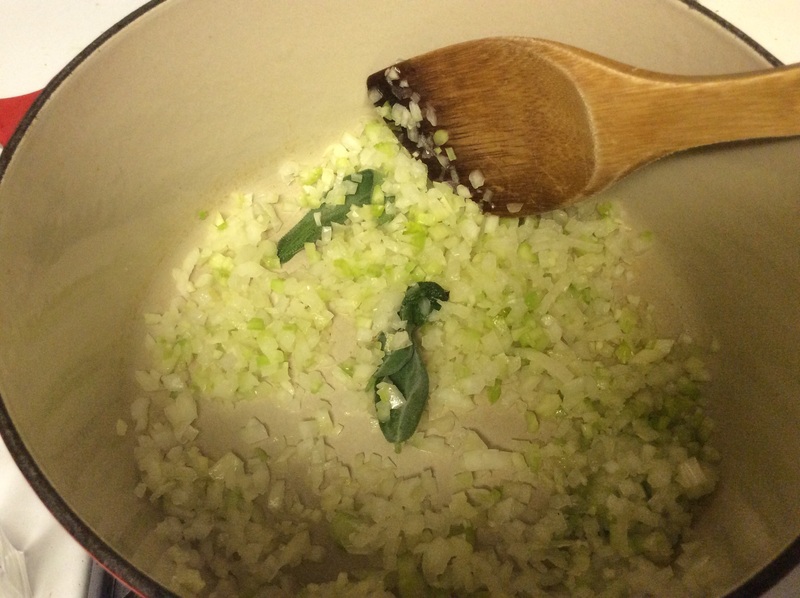 Add the onion, celery, garlic, and sage leaves. Stir constantly for about ten minutes or until they have softened. Remove the sage leaves. 7. 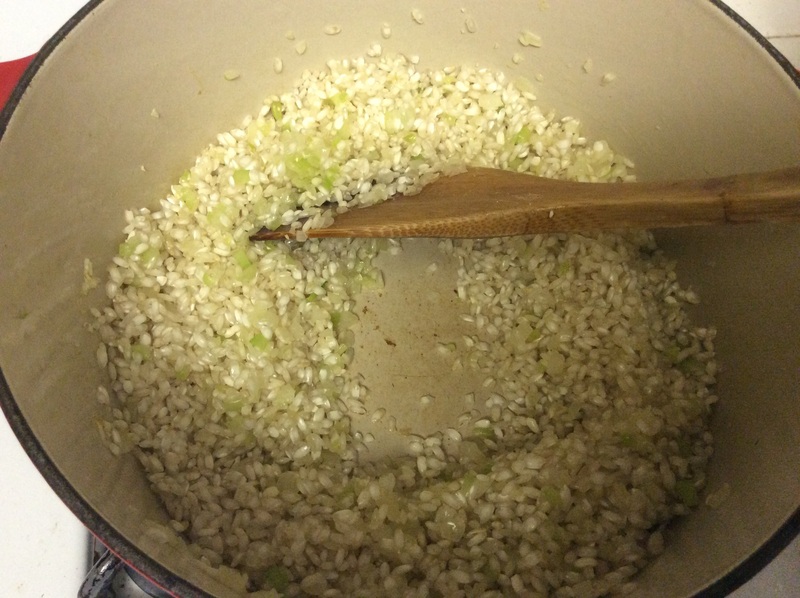 Add the Arborio rice, making sure the rice is coated with oil. Stir for about two minutes or until the rice is translucent. 8. Add the Chardonnay to the rice and stir until evaporated. 9. Add one ladleful of stock to the rice and stir until evaporated. 10. Repeat this process one ladleful at a time, each time making sure it is cooked off before adding the next. This process should take about 20 minutes and the rice should be al dente. 11. Add the butternut squash and stir gently. Remove from heat. 12. Stir in the Parmigiano-Reggiano, butter and salt to taste. Close the lid and keep covered for two minutes. 13. Spoon the risotto into shallow bowls and drizzle with olive oil. Sprinkle roasted hazelnuts on top. 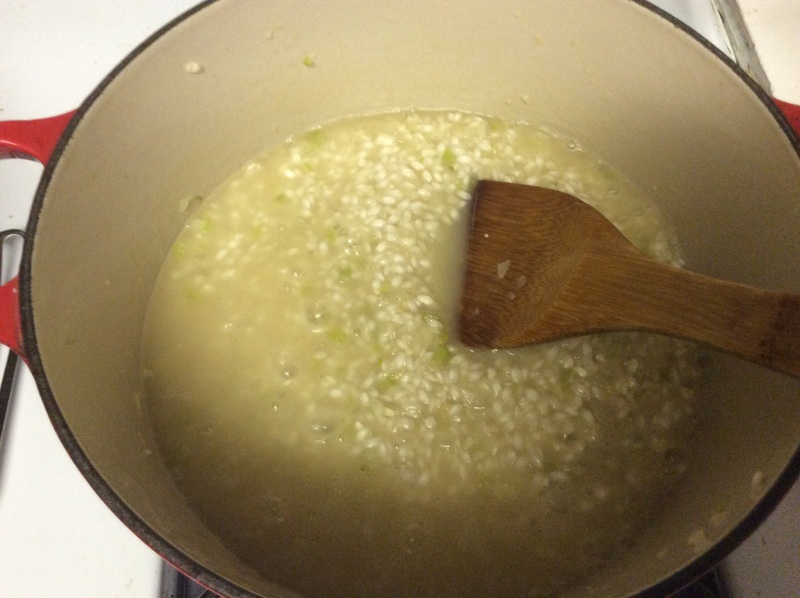 This entry was posted in Italian, Risotto and tagged butternut squash risotto, Risotto on November 3, 2015 by food4so.